While there are some pace-of-play initiatives introducing a clock to the game of baseball, the traditional game doesn’t worry about a clock the same way football, soccer and basketball do. Half-innings end when three outs are made, not when the clock runs out of time. But for a game without a clock for officials to manage, there are times when officials will need to watch a clock. Sometimes, a game is played under a time limit, which introduces an element the usual rules of baseball don’t cover. Any time that happens, you can expect there will be points of contention umpires will be asked to sort out. Time limits are commonly seen in youth tournaments, adult leagues and freshman and JV play. Sometimes, certain varsity games will have a time limit. The limits are typically straightforward: No new inning will start after so much time has passed, but the current inning is played to completion. 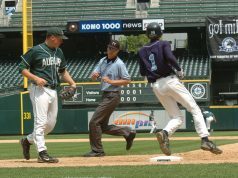 In some cases, particularly weekend tournaments concerned about keeping a schedule on track, there may be a hard stop in the middle of an inning, but the score typically reverts to the last completed inning (just as if the game had been stopped because of bad weather).